Selling our self-produced ‘Here We Go…Again‘ fanzine (for the Northern Ireland national team) next to Marty Lowry for years had meant we chatted about all sorts of random things, including Marty telling me about Shaun with an H. This man was Shaun Schofield, who had been attending every single Northern Ireland home and away match since the mid 1990s. And what’s more he isn’t even Northern Irish. Shaun is an Englishman, brought up in Lytham St. Anne’s near Blackpool. Although I had been aware of Shaun’s exploits for many years, for some reason I didn’t actually meet him until July 2006, when I travelled to Manchester for a five a side football tournament. 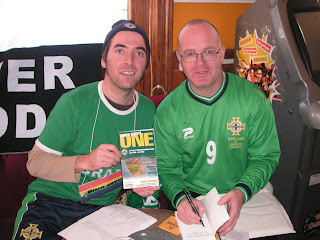 It was shortly after he had released a book called ‘There’s Always One’ based on his experiences going to EVERY Northern Ireland match for ten years between June 1995 and June 2005. To this day, he still hasn’t missed one since then, and in November 2007 clocked up his 100th Northern Ireland match in a row. So in July 2006 I first met Shaun and immediately bought his book ‘There’s Always One’ which cost only £10 with all the profits going to two charities – Action Cancer and Heartbeat. 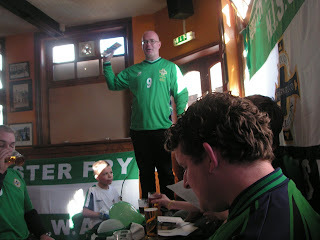 It was then I also invited Shaun to be the special guest at the next South of England Northern Ireland Supporters Club meeting on the Isle of Wight as part of his book promotion. I also asked Shaun to join our club, which he naturally did. Just how good is his book then? Well if you’ve met Shaun you will know that he can tell a story or two! He could keep you occupied for hours listening to stories of gaining Moldovan passports, forming a Calais and Estonian Northern Ireland supporters club, being in Russian states just after the fall of communism. But that is the beauty of this book. It is so graphic, you envisage yourself being there. Any football fan who has followed a team with passion through good results, bad results and so on will be aware of how enjoyable a lifestyle it is. I myself have followed Bournemouth regularly home and away for some 5 years now, and Northern Ireland at home for almost 20 years, but only Northern Ireland away for 4 years. Shaun puts other supporters to shame. His journey began back in 1993 when he blagged his way to Albania with the official IFA party. Having been at the 1990 World Cup with England, he turned his love to the smallest of the British nations – little Northern Ireland! From that Albania match onwards, Shaun met some amazing people from all around the world, indeed Shaun has travelled to four continents to watch Northern Ireland, who have never actually played in the other two continents anyway! (Africa and South America). Of course the money he spent is mammoth, but immaterial! Shaun Schofield, PO Box 4292, Dunstable, LU6 9AR. 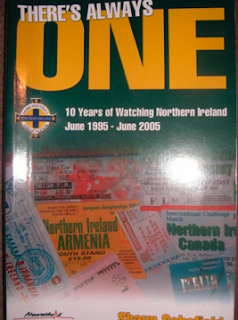 This entry was posted in Book Reviews, Books, Europe, Football, Here We Go...Again, Northern Ireland Football Team, Other Football, Shaun Schofield, There's Always One. Bookmark the permalink.